Your Happy Place: The slogan says it all!!! My husband and I visited the Virgin Islands for our 1st Anniversary. It was an awesome trip with lots to offer. We enjoyed the beaches, site seeing, shopping, restaurants and much more. Mr. Nice Guy (our transporter and guide) took us to BB at least three times during our visit. The breakfast and lunch menus are very gourmet, with unique flavor combinations. On one of our visits I had the Buddha Blessing Sandwich and Creamy Tomato Basil Soup. BB also has some of the most delicious brownies and muffins. The Carrot Muffin was the best ever!!! Also served, are a variety of teas, soups and salads. The coffee bar was superb. The Baristas offer exceptional service and explained the drink menu very well. After lots of contemplating, I had a very creamy and perfect coconut latte. Another unique feature is the boutique, located adjacent to the BB restaurant/coffee bar. BB is a must if you are ever in the Virgin Islands. 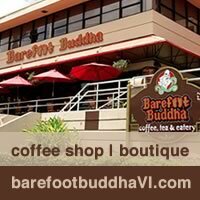 Categories: Uncategorized | Tags: Barefoot BuddhaVI, boutique, coffee, latte, pastries, sandwich, soup, tea, US Virgin Islands | Permalink.